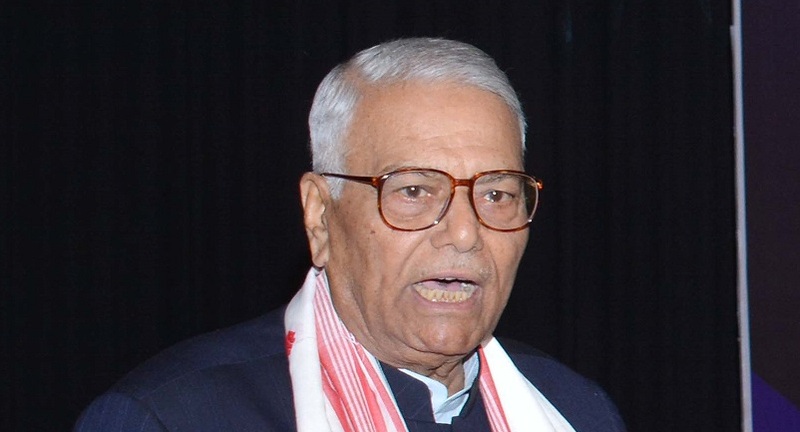 Launching a scathing attack on Prime Minister Narendra Modi led BJP government at the Centre, former BJP leader and Union Minister Yashwant Sinha on Sunday said that the current BJP government at the Centre has been challenging all the constitutional conventions and destroying all democratic institutions of the country. “The Finance Minister came to know about the demonetization only when he was on his way to the Cabinet meeting where the Prime Minister announced demonetization. So policies are being framed from the PMO. You take up any of the Budget speech of the Finance Minister and see for yourself. He falters, he halts, mispronounces … it seems that he was reading something which was written by someone else,” said Sinha. “While reading the Budget speech in 2017, the finance Minister said spoke about ease of doing business. Then he read ‘now we are going to concentrate on ease of leaving’ instead of ease of living’. Soon after that Vijay Mallya escaped…. this is the condition of finance minister,” he said. Taking on the external affairs minister, Sinha said that he does not remember one occasion when the Prime Minister has asked the External Affairs Minister to accompany him during his foreign tours.